Stops Dirt and Water in its Tracks with these perfect floor mats! Perfect for pets and kids, this amazing door mat will save you the daily battle cry of “take your shoes off!”. This Super Absorbent Door mat (Rug) keeps dirt trapped at the doorway and out of your house. Avoid dirty footprints on the carpet! Anti-Skid NEOPRENE backing that's safe on all floors unlike a traditional rubber backed mat that can stain or even yellow expensive floors. No funny odor or rubber smell. Ultra thin door and floor mats will fit under almost any door. They are lightweight, 100% Machine washable and low temp dryer safe as well. The high quality cotton structure absorbs liquid in an instant, while the microfiber locks in the dirt and muck. Stop the sand, snow, grass, leaves, pine needles, and road salt at the door. The non-slip PVC backing lets you wipe your feet thoroughly so that even the most stubborn mud and dust stays at door without you having to take off your shoes. Clean Step Mat absorbs mud like magic! Clean Step Mat, the super absorbent doormat traps dirt and water instantly, keeping floors clean and dry. Non-slip latex backing won't slip or scuff floors. Low profile design so doors won't get stuck. Machine washable. Just step on the Clean Step Mat and millions of absorbent super fibers soak up the mud and water. Perfect for soaking up rain, snow, slush, sleet, and mud, it's a must-have mat for every entrance of your home. Standard Size Doormat: 18" x 28"
Hand wash then hang to dry, or spread the mat in the shade until dry. 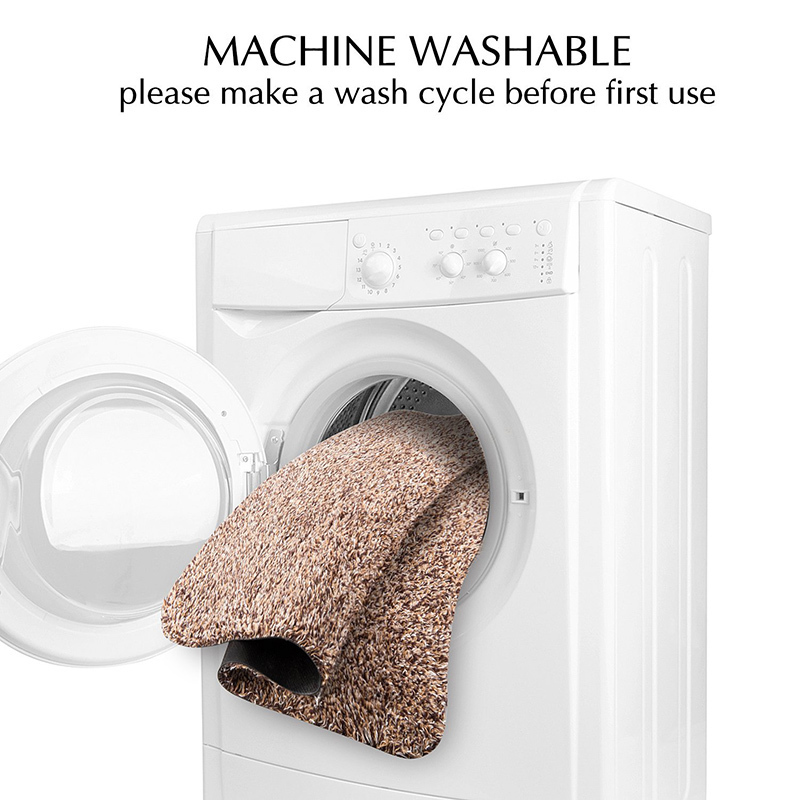 Machine wash cold below 30˚C in delicate cycle then tumble dry in low heat less than 50˚C. Do not use bleach, abrasive solutions, fabric softener, these may destroy the product ability to clean. Do not iron, do not dry clean.